Marcia Sommer (left) leaves her volunteer group to deliver supplies during a meet-up at Port Susan Bay to re-install bird boxes. STANWOOD — Teams of three or four spread out over the slick mud, wet grass and scattered driftwood. One person held a ladder, a second hauled tools and other teammates carried bird boxes and hollowed gourds. They were the same boxes and gourds that came down at the 4,100-acre Port Susan Nature Preserve more than four years ago when the Nature Conservancy began a $4 million project to breach the dike around 150 acres of former farmland. High tides now flood the area with saltwater, which mixes with fresh water to create an estuary where juvenile salmon and other native species can live. The bird boxes used to be home to songbirds. After the dike was breached in 2012, volunteers with the conservancy started seeing a shift in bird populations at the preserve. Waterfowl such as geese and dabbling ducks showed up while the number of songbirds dwindled. On Saturday, 14 volunteers put the bird boxes and hollowed gourds up on wooden pilings around the estuary. They hope to draw a greater variety of birds back to the area. “We’ll put them back up and see what kinds of customers we get,” stewardship coordinator Joelene Boyd said. The gourds are mainly to attract purple martins, a large North American swallow known for its aerial acrobatics. The boxes tend to attract smaller varieties of songbirds. Volunteer Donna LaCasse drove up from Tacoma to help with the bird houses. She appreciates the estuary as a habitat for salmon but her favorite thing about the area is the birds. With few places at the site for songbirds to nest, the bird boxes could make a big difference, she said. Though breaching the dikes was the biggest piece of the restoration project, other work continues at the Port Susan Nature Preserve. Along with the bird boxes, volunteer parties have cleaned up trash and weeded out invasive plant species that choke out native marsh grasses. Sue and Ray Oliver are longtime members of the Nature Conservancy. They have been involved in numerous volunteer projects. “There are so many beautiful things they’ve done and I can’t not help out when I’m able,” Sue Oliver said. Before work began Saturday, volunteers formed a circle to introduce themselves. The talked about where they were from and their favorite variety of bird. Volunteers came from Stanwood, Camano Island, Seattle, Tacoma and Wenatchee to help with the project. They are fond of blue jays, cormorants, ospreys, hawks and eagles. 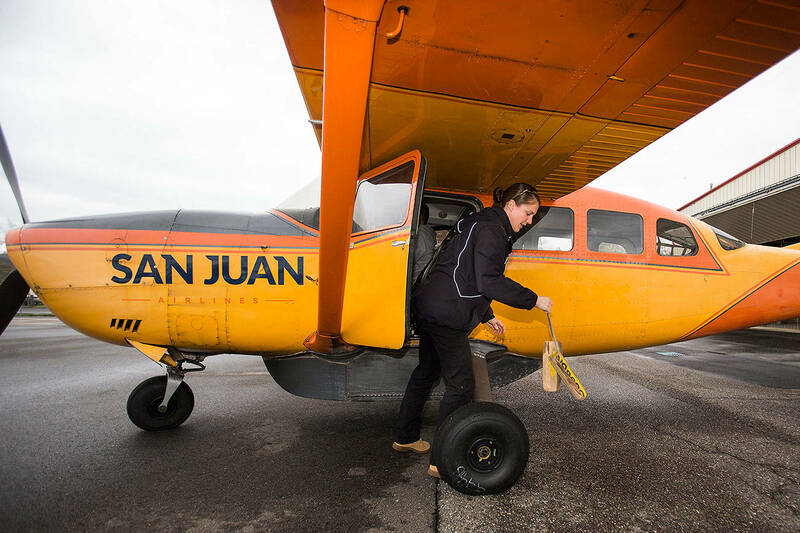 The drumlins that swerved in the sky above the estuary as though they’d choreographed an aerial dance were the highlight for Boyd, who pointed them out to her volunteer teams. Helping with conservation projects is something anyone can do, LaCasse said. She likes to see groups of people coming together no matter their hometown or age. Max Tinsley was one of the locals at the preserve. He’s studying environmental science at Everett Community College with plans to transfer to Whitman College and eventually Western Washington University for graduate school. Tinsley lives in Stanwood and saw the volunteer event as a chance to learn more about his major and to make a difference close to home. The Nature Conservancy is planning guided tours of the Port Susan Nature Preserve on Feb. 27 and 28 during the Snow Goose Festival. The preserve is located at the end of Boe Road in Stanwood. Volunteers Marcia Sommer (left) and Sue Oliver high five after setting up their last of seven bird boxes Saturday at Port Susan Bay near Stanwood. Volunteers Ariel Davidson (left) and Sean O’Connor trek through mud and rocks Saturday with Lauren Miheli, one of the project coordinators, to set up bird boxes at Port Susan Bay near Stanwood. Jolene Boyd, one of the project coordinators for the Nature Conservancy, explains the geography of Port Susan Bay before volunteers began setting up bird boxes and gourds Saturday near Stanwood. Sue Oliver (right) watches as Marcia Sommer drills in the last bird box at Port Susan Bay on Saturday.